If you are relatively new to CrossFit (a year or less) you may have noticed that some folks in your gym have recently begun accessorizing like they are planning to fast rope out of a helicopter or breach a meth lab after they finish their workouts. Or maybe they are just wearing big old clunky garments that make them look like they are planning a 1920’s scuba dive. What the heck is going on here? Murph! That’s what! Those are weight vests my friend, and I’m here to talk about them… in excruciating detail. The general concept of the weight vest is pretty simple- it’s a vest that is heavy. It makes things hard. Easy peasy lemon squeezy. Well, this would be a boring article if that was where we ended things. Fear not- in our human quest to a) improve on everything and b) always look badass, people have taken the design of the weight vest to some very interesting places. For ease of understanding, I’m going to consider the three main types: OG, tacticool, and futuristic/techy vests. OG vests have been around for a while. First worn by boxers and other gym goers, they are made by all of the big gym equipment manufacturers (Harbinger, Everlast, Ader, etc.) and generally consist of a nylon vest with little pockets that you put smaller weights in. The plus side of these vests is that they are pretty versatile- you can add/remove weight as needed. The minus side is that they are usually uncomfortable, prone to having weights pop out and skitter across the gym floor and make you look a little doofy. Note: some OG vests have popped up with the functional fitnesser in mind that are a little more comfortable, durable, etc. They still look kinda doof. Tacticool vests are adopted from the military community. Remember, the work out we call Murph was originally created by Murph, and he called it Body Armor because he would perform it in the full body armor setup he wore in combat. 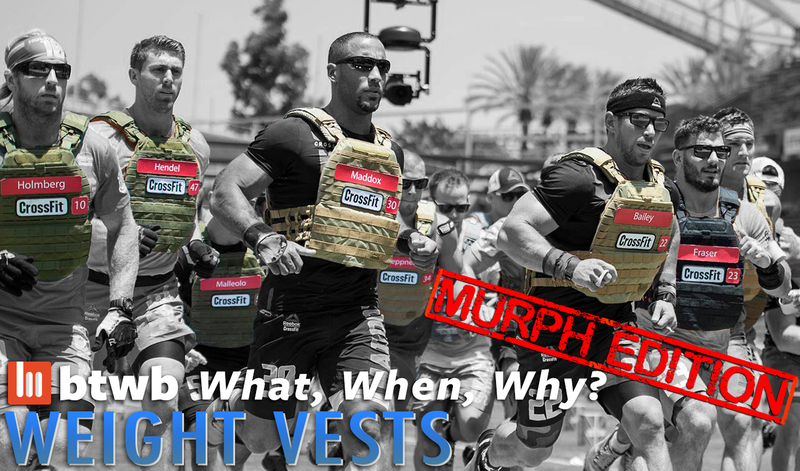 When CFHQ first programmed Murph, they suggested that if you had body armor you should wear it. These vests are called plate carriers and have pockets in them for armor plates, or I guess could hold a PB&J if you were really hungry/weird. While some enterprising sort probably figured it out first, at the 2016 CrossFit Games the athletes wore plate carriers from well known manufacturer 5.11 featuring steel weight inserts made by Rogue. That launched the trend of using plate carriers as weight vests- the 5.11 the Games uses is really nice and comfy, but you can use pretty much any carrier as they have roughly uniform pocket sizes that will accept the Rogue plates. Benefits of using a plate carrier are comfort- they are designed to be worn for long hours in hot climates and still allow their wearers to run/jump/fight, etc, and plates that are held very securely and won’t come out. Also, depending on who you ask, you look like either a super cool badass SF operator… or a kid playing army man. The downside is that they aren’t very adjustable- the plates only come in a few weights and can’t be changed on the fly. Also, depending on your feelings about military cosplay and/or if you don’t want to freak out your neighbors you may decide the tac look isn’t for you. Futuristic/techy weight vests come in a few different styles, all designed by people who looked at the clunky OG vests, scratched their heads and said, “well, that’s stupid.” These vests use modern materials, well thought out design, and other form factors to make vests that fit better, don’t get as sweaty/stank, and offer other cool features. One example, the Hyper Vest, is made with a stretchy, sweat wicking carrier that accepts really small weights that are very securely held. You zip it on so it’s pretty low profile, and it’s generally pretty comfy and relatively normal looking (looks sort of like a very burly fleece hiking vest.) Editor’s note: Hyperwear has informed us that they now make a more resilient vest using Cordura fabric- links and images have been updated to reflect the changes- we haven’t tried the new vest out yet, but it looks awesome! IMHO, the coolest techy vest is technically a shirt, made by Titin (of Shark Tank fame.) Titin uses gel inserts suspended inside a compression shirt, which lets you completely wash the compression shirt when you stankify it. Also, the gel inserts are the same density as muscle tissue, so it feels more like an internal load or part of your body vs. a clunky external load, and they can be heated in the microwave or cooled in the freezer to use as a recovery modality. The upside of the techy vests is comfort, form factor, and in the case of the Titin, additional use as hot/cold therapy. Downsides are price- they can run you a good bit more than an old school vest or plate carrier. You could theoretically use a weight vest whenever you want, but you will (unsurprisingly) feel the effects more during bodyweight movements. Many people wear it once a year during Murph and that’s it- in my earlier article I talk about why that’s not a good idea. In general, a vest can make some bodyweight training a little more spicy, or create a strength stimulus in movements that you’ve become comfortable enough with that you generally do big volume sets. Muscle-Ups are a good example- once you can do 5+ in a row, you can wear a vest to make them harder and build strength & control. This may be a bit redundant from the aforementioned article, but I think it’s worth mentioning- why wear the weight vest at all? If you’ve done Murph a number of times RXed and want a bigger challenge, sure throw one on! (Well, first train with it a bit, and then throw it on.) I’ve seen some instances where people use the vest as a convenient excuse to slow down- “Oh man, I did a 1:17:00 Murph, but I was wearing the vest, so you know…” As a coach, I’d rather someone push through a tough and relatively quick Murph (sub 40) a few times before using the vest. The vest shouldn’t add a ton of time to your Murph (maybe 10-15 min?) so don’t just throttle down because you have one on. Further, as I’ve said a bunch already, make sure your acclimated to the vest, or your joints will hate you. That’s it folks- have a fun and safe Murph and please warn your neighbors in case a bunch of people are going to be running around looking like GI Joes- unless you want a Red Dawn type of scare in your neighborhood!